the Canaanites, Amorites, Jebusites, Hittites, Hivites, Girgashites and the Perizzites. Joshua and the Israelites fought many a bloody battle. 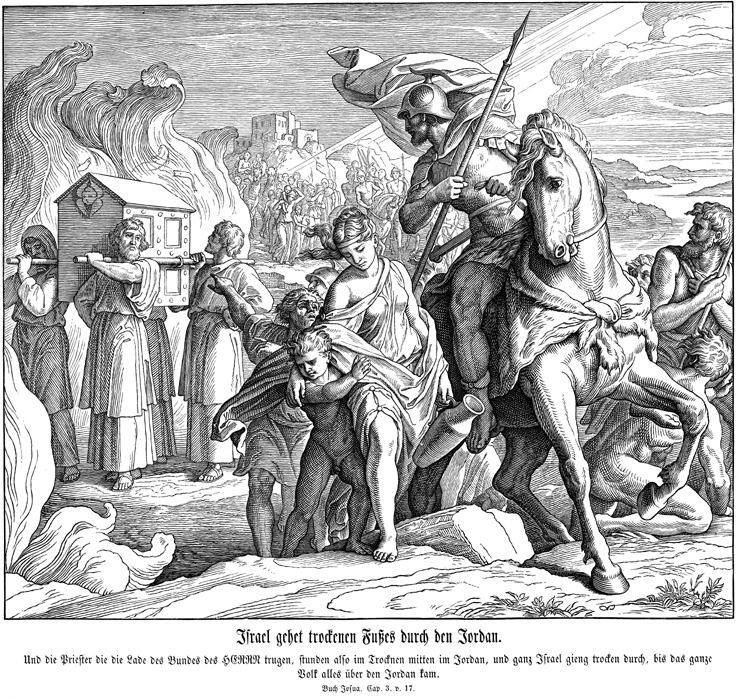 Modern/post-modern ‘sensibilities’ do not like the Book of Joshua because it is so ‘militaristic’ and violent. The Promised Land was given by the LORD but the people fought for it. We think enemies can be won over to be ‘nice’ like us. Give me a break. The seven nations had “detestable practices” , such as “child sacrifices, the practice of divination or sorcery, and occult activity. In addition, Leviticus 18 and 20 detail the rampant sexual depravity among the Canaanites.” (“The Peoples of Canaan, The Lutheran Study Bible, page 345). Joshua and the Israelites had passed over into an occupied promised land. Yet they are enemies, the cosmic powers, the spiritual forces of evil in the heavenly places, even in the Church, giving their consent to sexual immorality and covetousness. This blind world does not see it but we can see the breaking of every commandment every day on our favorite television programs. We have seen it in ourselves by God’s Law and we cry out, Kyrie Eleison, Lord, have mercy. By God’s grace alone in Jesus Christ, we see the 7 Nations’ occupation of our own souls. The name “Joshua”, literally means “God Saves”. Joshua in Hebrew is pronounced, Yeshua and transliterated into Greek it became Iesus, the very Name in the New Testament, then transliterated into Jesus. Joshua of old led the Israelites through the waters of the Jordan into the promised land for the conquest. Jesus Christ leads us through the waters of Holy Baptism into the promised land of eternal life and leads, “the pioneer and perfector of our faith” (Hebrews 12: 2) for our struggles, the crucified and risen Lord before us, beside us, within us, around us. He is the new and living covenant of the Lord of all the living who went through the waters for us and our salvation. We are living in an occupied land. The 7 Nations of Idolatry, Profanation, Restlessness, Greed, Adultery, Anger and Covetousness hold sway and with everyday occupied more of the land and that means her people. And it all looks good on our various screens. The Church of the New Testament went into a Roman world and they fought, not with Caesar’s swords but the Sword of the Spirit, which is the Word of God (Ephesians 6). The Lord’s orders are clear: “Bless those who persecute you; bless and do not curse them ” (Rom. 12: 14) and “Do not be overcome by evil, but overcome evil with good”. There are so many other Scripture verses on how to live as the Church in occupied land and the point is that those who are held captive can see the way of Jesus Christ in our life together and come to the joyful repentance. It is a long campaign and it is a slog. It is a slog when we see politicians approving abortion and the abortions of their conscience. It is a slog when we see church bodies emasculate even the mention of spiritual warfare as “too militaristic” so that a man and a woman does not stand in the battle and fight the good fight of faith (1 Timothy 6: 12) . It is a slog when in our lives we see so many fighting and fears within and without. It is a slog when we are overcome by the evil around us and think no one is with us: that is what the enemy wants us to think. Joshua took a stand with his house: we will serve the Lord. Jesus Christ took His stand and served the Lord to us all, the LORD God of Sabaoth for our battles and struggles to defeat the Hittites, the Canaanites etc.and now by His grace alone won over to the Lord. He made us His own, forgiven and drafted into His army. Joshua declared as for me and my house we will serve the Lord. In Baptism we renounce the devil and all his empty and false promises. More than ever, we need the conscientious decision of every family, every father and husband to say as Joshua did, “as for me and my house we will serve the Lord”, and not the false gods and practices of those around us, not only for our salvation but others to come to faith in Jesus Christ. Lord Jesus Christ, Your servant Joshua led the children of Israel through the waters of the Jordan River into a land flowing with milk and honey. As our Joshua, lead us, we pray, through the waters of our Baptism into the promised land of our eternal home, where You live and reign with the Father and the Holy Spirit, one God, now and forever. Amen.